VELODYNE MINIVEE SPEAKER 8" 1000watt subwoofer. I bought this from the original owner who never used it and it has been in a climate storage for several years. l took it out of the box to test it. This subwoofer is flawless! It is brand new, however I have to sell it as used because it’s been opened. It has the top and bottom packing foam inserts. Includes both Velodyne double boxes. The outer box is a little distressed from previous shipping. Again this sub is flawless!! Despite the fact that it's several years old, it still works perfect and looks new. Includes owners manual. It's rated at 100 watts RMS 240 Watts Peak. It has a sealed cabinet which has a 10" Front Firing Woofer & a 12" Bottom Passive Radiator. Velodyne VX Series VX 11 Self powered Lots of control Loud, tight, and shakes the windows Some slight cosmetic chips as seen in pictures. Sold as is. Works great. Shipped with USPS Retail Ground. Item Condition: Subwoofer was plugged in and powered on. Significant bass was produced. Speaker level inputs and outputs were also tested and working. No further testing was done. Sale Includes: Subwoofer only. Velodyne SPL Series II SPL8bgII. Velodyne HGS10BG High-Gain Servo Powered Subwoofer - 3000 Watts Peak Power! 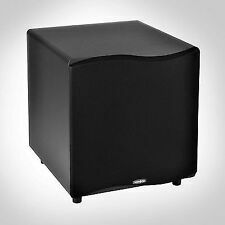 Velodyne HGS10BG Powered / Active Subwoofer. If you know Velodyne, you know the woofer surrounds were notorious for fading. It looks bad but the material is still soft and flexible. It is very hard to see through the font grill material anyway. Condition is Used. This is an excellent device for managing your subwoofer processing and perfect for just starting into the world of room equalization. • Works with up to 3 Subwoofers. I've hooked into my dedicated HT system in place of my HGS-15, and it sounds great. I used the settings as shown in the pic - I did not test any other functionality (like crossover, speaker inputs, etc.) - but I imagine they should work. Vintage Velodyne ULD-12 Subwoofer controller only uld-12 controller. Condition is Used. Shipped with USPS First Class Package. Entry level, 10" driver 100 watts RMS / 150 watts dynamic “Green” Class D amplifier Easy to hook up and use Efficient rear port design minimizes distortion Only issue is a slight buzz when on standby. 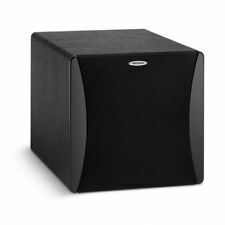 New in Box Velodyne SC-8 Subwoofer, Priced as a Single. These Are Passive Enclosures. Velodyne VRP Series VRP-10 Subwoofer ONLY. The SC-10 is small with a shallow depth and flush rear panel, so it can fit anywhere. It can be installed facing outward or facing downward for venting through the kick plate of a custom cabinet. The SC-10 has a bass range of 24 Hz–120 Hz at 3dB down. This is aVelodyne V-810X-B Subwoofer. Non smoker house. 15 W X 15 D X 16 H.
SEE PHOTOS. All images taken in house of the unit(s) being sold, except for multiple quantities where item received will be in similar or better condition. All pictures are taken in house. We strive for excellence and appreciate the. VELODYNE CHT-8 POWERED SUBWOOFER. 130 WATTS RMS. INCLUDES 12' GOLD CABLE. OR PICK UP 92592. LOOKS RESPECTABLE WITH LIGHT WEAR. This engineering marvel is lightweight with an aluminum cone, furniture-quality cabinet finish and concentrates its 300 watts of output power in the 38 Hz to 140 Hz range. Impact-Mini High Performance, High Value Subwoofer. Excellent condition. 100 watts power for great low end bass. 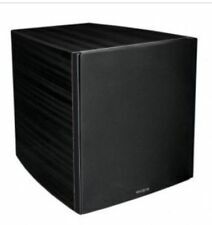 Verodyne Subwoofer VRP-10, VRP Series. This Subwoofer is equipped with speaker-Level and Line-level inputs. Use the line-level jacks when connecting this subwoofer to pre-amp, signal processor (such as LFE out) line-level crossover, or Receiver with pre-amp level output. It has been tested and proven to work. It hits hard. Velodyne VRP-12 Powered Subwoofer. It’s used, has been tested and worked. Unit shows some signs of use, wear and scuffs. Please see all the pictures for full details and condition. Sold as is. Up for sale is a New in box Velodyne Deco 5.1 Speaker System with 5 surround sound speakers Subwoofer NOS RARE. The speakers are still in the original packaging! The manual is included and the feet for each speaker is included and still has the sticky covered as new. This system retailed for close to $1500 when it was new. Please look at the pictures and ask any questions you may have prior to purchase. Velodyne FSR10BV 10" Powered Subwoofer. That premium has not been paid. That being said, we do understand that special situations can arise and exceptions can be made. Combined Item Invoices willnot be fairly calculated. See point above. This Subwoofer has been tested working onsite and is guaranteed. The Subwoofer has wear from previous use including scuffs and scratches. The wear is only physical and does not affect the functionality of the Subwoofer. Includes only the Subwoofer, No accessories. Photos are the of actual Subwoofer for sale. Inventory is on hand and ready to ship. Please feel free to message us any question you may have. Thank you for checking out our listing. Up for auction is a 15" Velodyne driver removed from a Velodyne F-1500-B Subwoofer that had a defective amplifier. As you can see the woofer surround looks great as the unit was repaired in the last few years. The 15" driver features a fiber/resin cone, 5/8" of travel, 3" voice coil, and 96oz magnet. If you have any questions feel free to contact us, thank you. We will do whatever it takes to make it right. 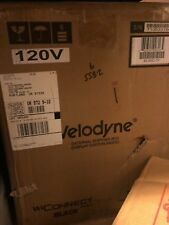 VELODYNE DLS-3500R IN GOOD, USED CONDITION. FULLY TESTED, SOUNDS VERY GOOD. REMOTE IS NOT INCLUDED, SUB FUNCTIONS FINE WITHOUT, BUT THERE ARE A COUPLE FEATURES YOU WILL NEED A REMOTE TO ACCESS ( DSP/ EQ SETTINGS, PHASE). Tested and everything works as its suppose to. Great sound. These have been touched up with a marker but are still there mostly on bottom. The bottom now has felt feet. The screen is good, but dose have a small hole with a faint run. 1 x Subwoofer with power cord. See pictures for more details. Fully functional item. Velodyne VX Series VX-10B Speaker SUBWOOFER.100 WATTS CLEAN! Very clean Subwoofer sounds and looks great! ● Low Pass: 50 Hz - 200 Hz Adjustable. ● Drivers: One Active 6.5" (with 64 oz. Magnet), Two 6.5" Passive Radiators. The sub is in excellent condition and works perfectly. ● Phase: 0. VELODYNE IMPACT-10BG 10" POWERED SUBWOOFER. Velodyne produces a great variety of acoustic equipment, and eBay makes it easy to browse its category of various affordable subwoofers. Velodyne offers amplifiers and subwoofers in both individual and combination units, as well as many subwoofer accessories such as additional amplifiers and microphone leveling systems. eBay lets you choose the right Velodyne subwoofer for your needs. How do the Velodyne subwoofers work? The majority of Velodyne subwoofers that you can find on eBay are combination systems powered by an internal amplifier. A single enclosed speaker box includes the subwoofer, amplifier, and controls. These subwoofers limit distortion to less than 5% with a patented accelerometer-based High Gain Servo System. Different-sized speakers are available in order to account for varying room sizes from small to large. The high build quality of these speakers delivers performance bass to enhance your audio media in the room of your choice. What subwoofer sizes does Velodyne offer? Digital Drive Plus 10 Inch: This speaker has a 1250-watt RMS, 3000-watt amplifier, and high gloss finish. Digital Drive Plus 12 Inch: This speaker is a larger version of the Digital Drive Plus subwoofer containing the same RMS, amplifier, and finish. Digital Drive Plus 15 Inch: This speaker is an even larger version of the Digital Drive Plus subwoofer containing the same RMS, amplifier, and finish. Impact-Mini 6.5 Inch Subwoofer: This speaker is a 6.5-inch subwoofer that comes in black ash or white vinyl colors and is powered with 120V. Microvee 6.5 Inch Subwoofer: This speaker is a 6.5-inch subwoofer that comes in anodized black or white aluminum and is powered with 120V. What accessories are offered for Velodyne subwoofers? One of the accessories offered by Velodyne is the Mic-5 Microphone Averaging System. This system is equipped to level up to five microphones. Another accessory offered by Velodyne is the WiConnect System. This system allows the speakers to receive the audio input wirelessly. The WiConnect has four different channels to use so that it does not interfere with the Wi-Fi connection in your home. The other accessories offered by Velodyne are a variety of amplifiers used to power additional subwoofers. These amplifiers also allow the user to get the benefits of the model-specific EQ settings that are not included in any other Velodyne amplifiers. Discover the perfect backpack, dorm room decorations, study supplies and great Veoldyne subwoofers to prepare for going Back to College. Content provided for informational purposes only. eBay is not affiliated with or endorsed by Velodyne.